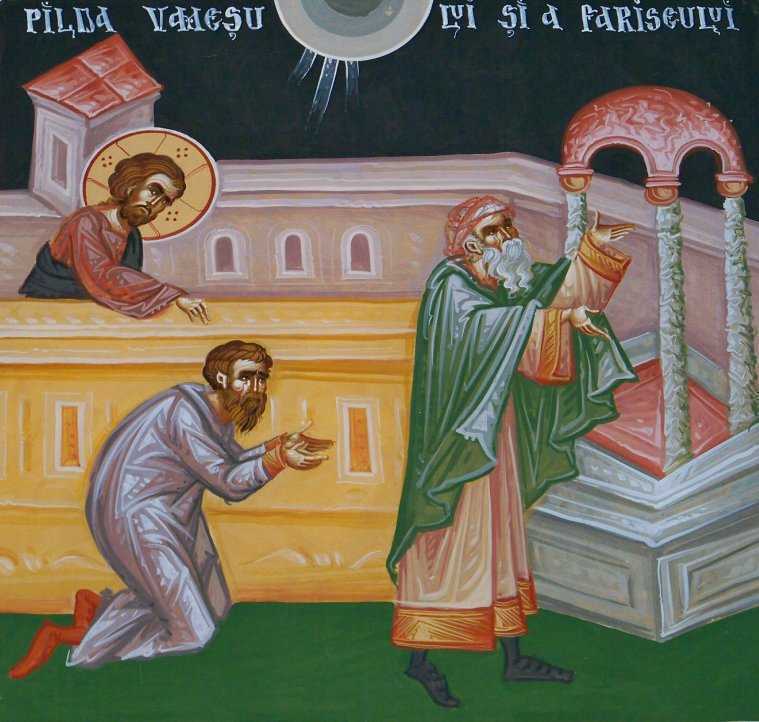 Last Sunday, we focused on the parable of the tax collector and the Pharisee. You will remember that the Pharisee was so filled with pride that he prayed to himself in praise of his virtues as he condemned the tax collector, who was so aware of his sins that the only prayer he could muster was a humble plea for God’s mercy from the depths of his heart. 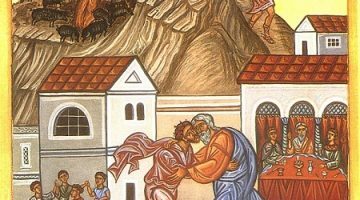 As we prepare for the intensified spiritual disciplines of Lent, it is clear whose example we must follow: that of the tax collector who returned to His house justified. 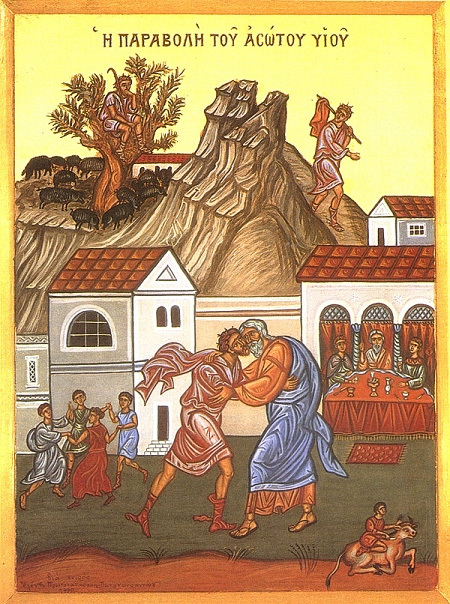 Today we turn our attention to our Lord’s parable of the prodigal son. This young man was focused only on himself at the beginning of the story, which is certainly a form of pride. His father meant nothing to him at that point other than as a source of money which he could use to indulge himself in the pleasures of the flesh. That is why he asked for his inheritance and left his family and homeland. Before long, however, the young man was humbled by the consequences of his way of living when the money ran out and he was simply a stranger in a strange land in the midst of a famine. He was so miserable that he actually envied the food of the pigs which he was hired to tend there. Truthfully, he had lived like a pig and now he ended up with them in their filth. At that point, the young man came to himself, recognizing that even the hired servants of his father were well fed. By suffering the consequences of his actions, his eyes were opened to how he had treated his father; he knew he was no longer worthy to be his son. He wanted only to become a servant in his family’s home and rehearsed his apology to the old man as he undertook the long journey home. The prodigal son certainly grew in humility through that process. He made no excuses for his behavior and knew that he would be lucky to be taken back into the household as a servant. Pride takes different forms. Some like the Pharisee think that they are so much better than anyone else and become blind to their own sins. Others insist on being so self-reliant that they would rather remain isolated in misery than to ask for mercy that they do not deserve and cannot control. Some would prefer to continue suffering the consequences of their actions than to risk exposing themselves to the healing grace that is beyond their power. Some who are quite well aware of how miserable they are prefer simply to wallow in the corruption of their sins than to acknowledge that they need help well beyond what they themselves can provide. In contrast to that form of pride, there is the courageous humility of the prodigal son. Think for a moment how he must have felt. He had no idea how his father would react to him. By taking the long journey home, he might have been setting himself up for final rejection and condemnation. Thankfully, he was not so enslaved to being in control or completely self-reliant that he chose the isolation of perpetual suffering over the possibility of even a low level of reconciliation with his father. He was no longer the self-centered fool who had insulted and abandoned his father in order to waste his inheritance on prostitutes. No, he had developed the eyes to see the gravity of what he had done to himself and to those who loved him. He risked what little shred of dignity he had left by going home, apologizing, and facing the consequences of actions. His only hope was in his father’s mercy. It took courage for him to face the old man under those circumstances. By taking that difficult trip home, the prodigal son put himself in the place to receive the father’s overwhelming love, forgiveness, and restoration. The father was not interested in exacting justice or requiring the son to pay a penalty. He did not condemn or embarrass him or even remind him of the bad things he had done. No, he simply welcomed his son back into the family with joy beyond what anyone would have expected. If we take the spiritual disciplines of Lent at all seriously, we will gain a deeper level of insight into how we have used our Heavenly Father’s blessings selfishly for the satisfaction of our own distorted desires. We will see how we have weakened and diminished ourselves to the point that we have become slaves to pride, anger, lust, gluttony, and many other passions. We will know that we have debased ourselves to the point that we deserve the full consequences of our actions, hardly being recognizable as those called to become like God in holiness. Through our struggle to pray, fast, give to the needy, confess and repent of our sins, and heal broken relationships with our neighbors this Lent, we will open our eyes at least a bit to what we have done to ourselves in turning away from the blessed life for which our Lord made us in His image and likeness. That is how we will begin the long journey home to a Father Whose love is not a matter of mere justice in the sense of giving us what we deserve. If that were the case, there would be no hope for any of us. Christ used this parable to encourage those who know their guilt and brokenness not to give up hope. Repentance is precisely the long journey home that the prodigal took in order to return to his father. It is the journey that we all must take this Lent. If we have any doubt about the mercy of our Heavenly Father, we need only remember that Lent is preparation for following our Lord to His cross and empty tomb. What greater expression of the infinite mercy of God for sinners could we possibly want? Christ has taken the full consequences of all human sin upon Himself in order to deliver us from them in His glorious resurrection. By normal human standards, that is far more outrageous than the response of the father in today’s parable. We are not speaking here merely of exceptional human kindness, but of the One Who spoke the universe into existence submitting to death at the hands of those He came to save, descending to Hades, and then rising in glory in order bring us into the fullness of the holy joy for which He created us. In Lent, we prepare to journey in Him from death to life, from suffering the consequences of our self-centered addictions to our passions to full restoration as the beloved sons and daughters of the Lord through His glorious resurrection. So like the prodigal son, let us come to ourselves and return to our Father with true humility. Without excuses of any kind, let us open ourselves to the great of joy of those who were dead returning to life, of those who were lost being found. That is what the coming weeks of Lent are all about. Let us use them courageously for our salvation.